It's time to have dinner My Way. Get more choice by switching out key proteins on Family and selected Classic bags, and get something you'd prefer instead. You can set it once and forget it, and what's more, it's completely free. Whether you're looking for quick and easy, inspiration or want to lose weight, we've got 16 food bags to choose from, and the ability to select the meals that best suit your household. 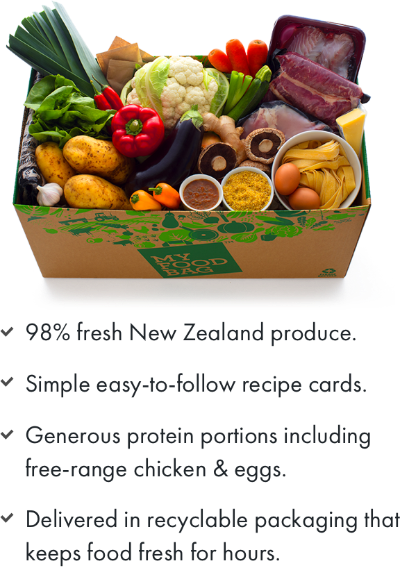 We source the best New Zealand produce and free range meats, then Nadia and our chefs create new, mouth-watering meals each week. We hit the roads every Sunday and Monday, rain or shine, delivering all you need to make the coming week easy. Our Woolcool keeps items fresh for hours! You can choose your protein preferences and "set & forget" or visit us each week to choose your meals. Available on our Family and Classic Bags. You get clear, step-by-step instructions so you can cook with confidence from quick, 25 minutes meals to inspirational dishes to wow your loved ones, we make sure our recipes are thoroughly tested before they reach you - because cooking should be easy, not a test! Our team of chefs and nutritionists are lead by Nadia Lim, so you know you can feel confident you're eating a healthy, balanced diet.